You know you have a bit of a reputation as a Creme Egg addict when multiple people send you a recipe for deviled Cadbury Creme Eggs. And you know what? I'm okay with that. Because they look amazing. 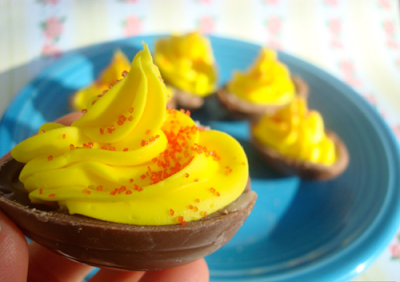 I mean, seriously—what could make Creme Eggs better than adding buttercream frosting and sprinkles to them?